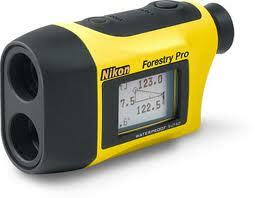 The new Nikon Forestry PRO Laser Rangefinder/Hypsometer offers multicoated optics and measures distance, height, and vertical separation and angle. It has both internal and external LCD displays that show simultaneously. With 6x magnification monocular viewing, the PRO has two measurement modes. First Target Priority Mode displays the range to the nearest target taken from multiple results obtained with a single measurement. Distant Target Priority Mode displays the range to the farthest target also taken from multiple results obtained with a single measurement. Measurement range is 11-550 yards and 33 to 999 feet. Accuracy is +/- yard out to 99 yards and +/- 1 yard from 100 to 550 yards. The Nikon Forestry PRO is waterproof and fog proof and powered by a 3V CR2 battery (included) Comes with field case and instructions.